Once you've Added your App to iTunes Connect, and Built your App for Distribution, the app will appear in the Organizer window of Xcode. This is where you'll validate and submit the app to the App Store. Application - Your app name will only show up here if you've added the app to iTunes Connect, and the app's status is Waiting for Upload. Code Signing Identity - Choose the same distribution profile that you used to build the app. If you get an error about missing Newsstand features, edit your Info.plist file and remove the Newsstand Icon entry from the Icons property. For other errors, consult the Apple documentation. If validation succeeds, you'll get "Appname has passed validation and may be submitted to the App Store." As before, you'll need to enter your iTunes Connect credentials, and select the distribution profile that you used to build the app. Now the app status will say Submitted in the Organizer. 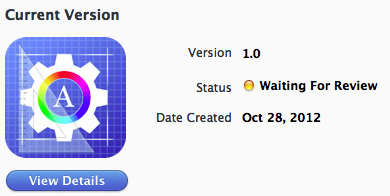 Once your app is uploaded an waiting for review, it can take a week or more for Apple to approve the app. You'll receive an e-mail once your app is approved. This site offers recent checkpoints of review times: How long will app review take?